Thank you for inviting me to join you on this important day. I’ve enjoyed so much the opportunity to get to know this campus community. I’ve spent time on many of the University of Wisconsin campuses over the years, you have a real gem here at “Boo U,” in both the people and the place. So treasure that and be proud that you came from here. Dream big! Aim high! Follow your heart! Climb every mountain, ford every stream, and do it your way! Insert vacuous inspirational quote here! But I’m a practical person and so I’m not going to do that to you. Because you are practical people, too. How do I know that? Because you made the practical investment in yourself and your future that a two-year (and in a few cases four-year) public higher education represents. And you’re here today. Which means you looked at the investment you were making and said, I better show up. And you did: You came to classes. You did the work. And now you are graduating. Some of you are probably quite certain of your next step. Some of you are probably still figuring that out. But before you take that next step, whatever it may be, I want you to take a look at the ground beneath your feet and see what’s really there. Because we’re practical people, right? This part is decidedly NOT about rainbows and puppies, but it is about doing it your way, so bear with me for a few minutes here. The times require us to ask deep-rooted questions and to disturb the ground. You are entering (or in many cases have already entered) an economy that is very, very different from the one I walked into as a recent college grad. You’re entering an economy with one of the worst income inequality levels in the world, and the gap between the very richest and all of the rest of us is widening, not getting better. The workplace is changing, as is the very nature of work. We have the gig economy in which independent workers, like Uber drivers and people who sell things on eBay, face financial insecurity. And some experts say we are trending toward a “jobless economy,” in which technology takes over much of the work and we find other ways to distribute essential income. We have an expensive for-profit health care system that fails to promote widespread health and wellbeing. The US has shorter life expectancies and more chronic health conditions than other developed countries, but pays more for these poor outcomes. We have a mass incarceration system that has recreated a sort slavery, where millions of human beings, particularly people of color, are working for free on prison farms or in prison factories. 25% of all the people who are incarcerated in the world are incarcerated in the US. It’s a huge industry. We have a vulnerable, hyperpartisan democracy in which the fight for equal access to vote is still being waged and where corporations are considered humans with inalienable constitutional rights. 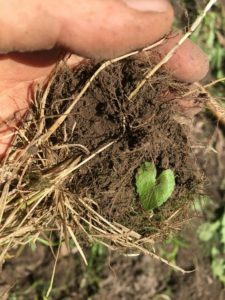 And perhaps most importantly, the ground beneath your feet is literally shifting, thanks to climate change. Because our nation has failed to do the work to mitigate and adapt to climate change, your generation must step up the pace of that work. But I’m noting these conditions of the country you are stepping into because I respect you and I think you deserve realism. You deserve to have someone acknowledge the challenges you face, and, like the good mom that I am, I’m going to tell you that you are up to those challenges. You will no longer be able to take your associate’s or bachelor’s degree and just enter the world your parents and grandparents laid out for you to expect. Well, you might for a little while, but sooner or later you will have to adapt to the new world or be part of remaking it. For most of human history, expectations were set by the generations before: An agricultural economy bred farmers, a guild economy bred guild members, a blacksmith bred blacksmiths, a leatherworker bred leatherworkers. An industrial based capitalist economy breeds workers and managers who live for a weekly paycheck and investors who live for a payoff. That one sounds familiar, right? It’s what your parents and your grandparents grew up in. But now, here, the rules have been erased. The infrastructures and systems prior American generations relied on are in shambles. It’s scary but it’s also reality, and more importantly, an opportunity. A friend of mine asked me what I was going to say to you today and when I told her she said, “Right. Tell them this is a time for DOERS. You don’t get to be passive, sign up for business as usual.” Because there is no business as usual. You’re practical people. What would smart, practical, realistic people like yourselves do with this information? I hope what you will do with it is to take it as an invitation—maybe even an imperative—to become REINVENTORS. You are gaining expertise that will be important to answering this call. In your studies of health sciences—nursing, biology, physical therapy—in your pre-professional preparation for medical or law or dental or veterinary school, in your studies in engineering, sustainability, wellness, business, writing, music, and the other arts, you are developing the expertise we need in key areas for reinvention. I also know that 58% of you identify as first-generation college graduates, so you know what it means to make your own path, to take a different journey than your families of origin, to BE different. I was that first-generation college student, too. After I went to college, three of my four older sisters went to college. So did my mom. When we change our path, we transform others’ lives with those choices. You first-generation graduates can teach us a lot about reinvention. Who is being served by that way of doing things? What assumptions have we been relying on, and what has changed since we made those original assumptions? What do we need or want instead? What are we willing to change to get it? These are questions with deep roots. When you begin to really pull at them, you disturb the ground. And that’s what we need. We need you to ask these deep-rooted questions and disturb the ground. We need you to be the reinventors of whole systems: Redefining work and the economy, securing our democracy, reforming our justice systems, rethinking health care, radically restructuring how we generate and use energy, and figuring out how we make fulfilling, safe, and sustainable lives in this time of climate change. 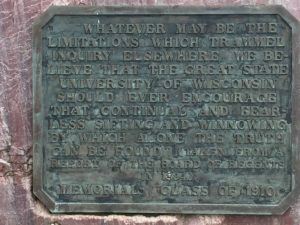 A plaque on the University of Wisconsin-Baraboo campus commemorating the Wisconsin Idea. Dream big? Yes, but more importantly, I encourage you to dream differently. This is not your grandparents’ world. This is not your parents’ world. It’s not even mine. It’s yours, and all bets are off. Go make the world what it needs to be for you and for future generations. ← Why You Should Run, Even Now. Especially Now. A good taste of reality. A large part of life is about being able to adapt to a constant changing environment.